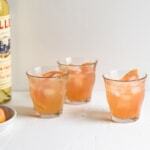 This Lillet-Grapefruit Spritzer is pretty, refreshing, and not too sweet. If you don’t love grapefruit, use an orange instead for a twist on the classic Mimosa. Fill a pitcher with ice and add the grapefruit juice and Lillet. Stir to combine and gently top with the sparkling wine. Serve over ice, garnished with grapefruit slices, if desired.